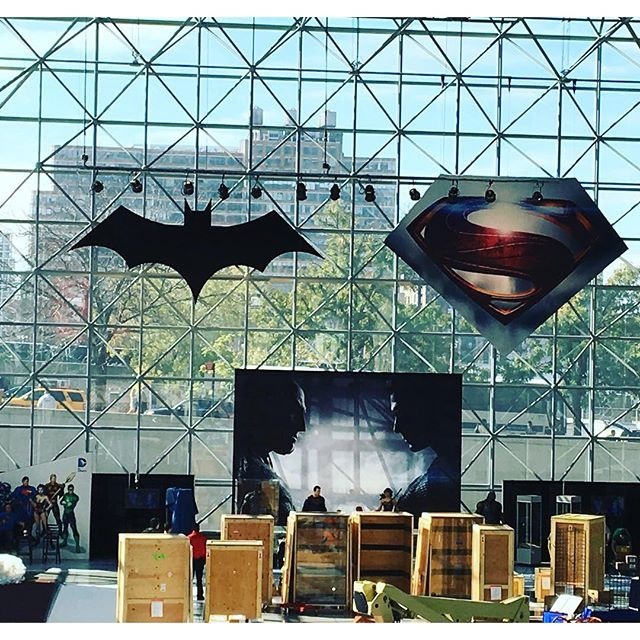 New York City's Comic-Con kicks off tomorrow, and thanks to whatchareading and thelocabat on IG, we got a sneak peek at the DC Entertainment booth this year. Here's a closer look at the Trinity on display. And guess who is trying to leave his mark at the con this weekend by providing free WiFi?.. Free WiFi throughout the Javits Center will be provided by LexCorp Industries. The news comes just days after Lex talked to Fortune magazine about his upcoming plans, and also joined Twitter. Keep your eyes open everyone, a certain villain has started crafting his evil plan..
P.S. We're standing by for news from NYCC, and will bring you Batman v Superman related scoop as we get it. UPDATE: Oh yeah, something is definitely going down! Lex just launched a new website that promises to show us "a lot" this winter. We can't wait! The collectibles at the con are also very revealing --> CHECK THEM OUT (spoilers ahead). More to come..